Lucy balancing on physioball as one her exercises for her arthritis. 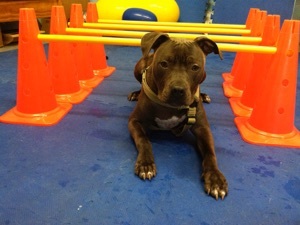 at New England Canine Rehabilitation and Fitness Center we treat each pet as if they were our own. We customize each fitness plan to fit the needs of your canine best friend and you. Our plans include but are not limited to: rehabilitation after surgical procedures, conditioning, fitness,weight loss and strengthening for our senior pets.